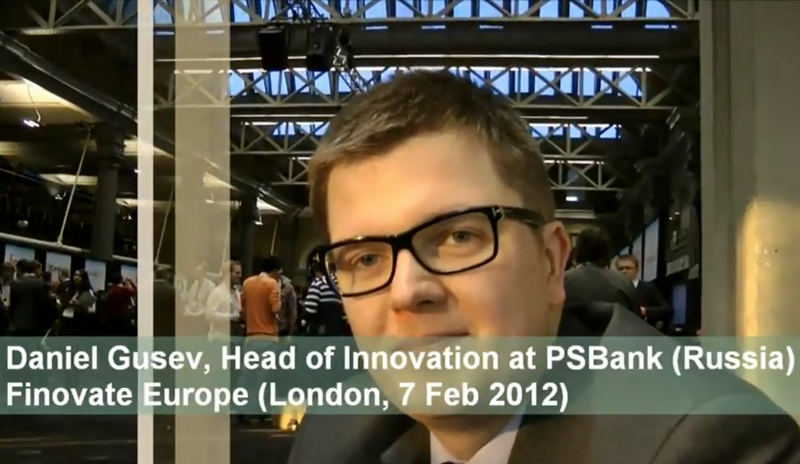 Last month at Finovate Europe 2012, I had the opportunity to catch up with my good friend Daniel Gusev who now heads up Innovation at PSBank in Russia. On that occasion, we recorded an interview where Daniel shares his views on social media and digital engagement in the banking industry. Daniel is a long-time supporter of Visible Banking, and he is one of the few people I invited to guest blog in the last couple of years. I am delighted to officially announce that Daniel joined our new ‘Visible Banking Stars‘ programme, so expect to read many more articles here on innovation in the Russian banking industry from now on. I invite you to watch my video interview where Daniel shares his vision on digital engagement and banking innovation and talk us through PSBank’s social media strategy. This short video with Daniel is available on our official youtube channel. Next articleRussian perspectives on Social Media in Banking: Having the Right Conversation.